Get the most out of your DR Trimmer Mower! The Quick-Lock Value Package includes the popular Quick-Lock Trimmer Head along with other useful accessories such as an 82' roll of the Sawtooth Trimmer Line, 48 lengths of Pre-Cut blue twisted cord and a handy holder which can be mounted to your Trimmer Mower. 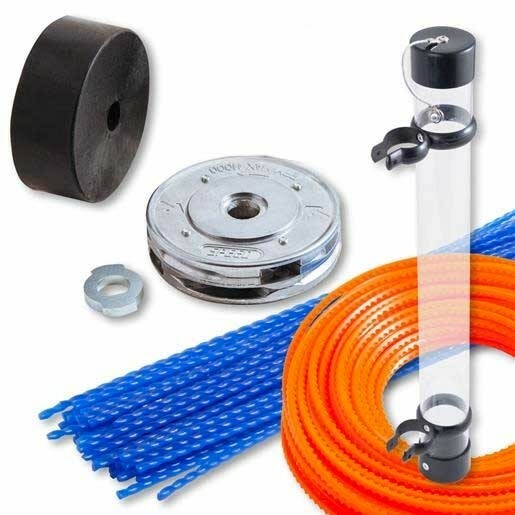 Quick-Lock Trimmer Head Kit : The Quick-Lock Trimmer Head allows you to change your trimmer cord in just seconds - completely hassle-free! Cord Caddy: Keeps your cutting cord in a handy holder mounted to your DR Trimmer Mower handlebar. It saves you time when you are trimming, keeps downtime to a minimum. 48 x 4.5mm Pre-Cut Cord: Pre-cut cords cut to the perfect length for the Quick-Lock Trimmer Head! Be ready when you need new cord in the field with pre-cut lengths of DR's specially-formulated blue spiral cord. 82' Roll of 5.5mm Sawtooth Cord: The 225-mil Sawtooth Trimmer Cord is thicker, tougher, and longer-lasting than any other cord available - anywhere! The durable material and serrated design allow you to cut through the toughest weeds and brambles! The Quick-Lock Value Package is suitable for the current TR4 style Trimmer Mowers.